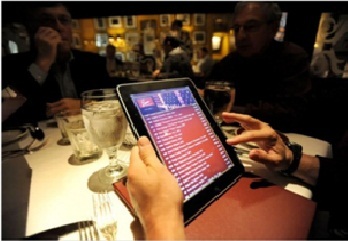 You are here: Home » How to put the iPad to work for your Restaurant! 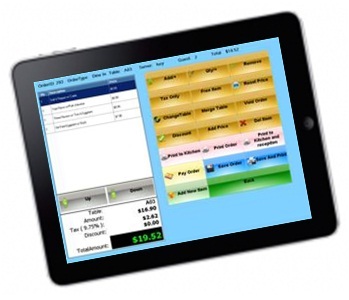 How to put the iPad to work for your Restaurant! Is it just me or is it pretty crazy how quickly technology is growing? I mean, I feel like it was yesterday the iPhone 2 was out, and now what number are we on? I think I’ve seen signs of the iPhone 5 on the web, just saying. Honestly, it’s amazing h ow tech-savvy this country is getting. It’s even reached the point where iPads are being used in restaurants to take and view orders. In fact, this new point-of-sale system is so fast that the chefs have the orders in front of them before the server has even left the table. Waiters don’t have to rush back and forth asking “what’s in this dish?” The recipe is right there in their hands. Good-bye impatient and hungry customers, hello efficiently satisfied bellies. Not convinced yet that this technology will be useful in your restaurant? With an iPad you can give your customers their own tablets to view a wine list or the full menu. Plus, you can let them choose for themselves what they’d like to eat and drink. You can virtually put the ordering process into your customers’ hands, and let them take control. Now we’re cookin! Let’s look at it from a payment perspective. How much do you hate it when you’re trying to get out of a restaurant, and the server is taking what feels like an eternity with your bill? Use an iPad and they’ve got the bill right there, not to mention you can even charge your card, table-side. Talk about stream-lining the process and taking “going green” to the next level! To keep this techie-talk going, let’s discuss mobile apps. Mobile apps have also changed the way we go out to eat. We no longer have to sit around and say “where should we go tonight?” Now, all we have to do is tap the app, and it’ll tell us where to go, what type of food to order, and how much to pay. 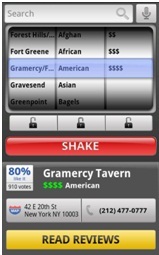 Apps like Urbanspoon, Where?, Around Me, Yelp, and Foodcaching all have this ability. They can even pull up a map to the restaurant and the phone number in case you need to make a reservation. And you can read reviews of the restaurant, in case you aren’t so sure about it. iPads, mobile phones, applications…I’m curious to find out what will come out next and how we can use it to continually facilitate the out-to-eat experience. ← Win A Trip To The NRA Show from ChefUniforms.com!